This was given to my mother in 1968, although as far as I recall she continued to mostly use her old 1930s one. It’s interesting in that it shows the transitional stage reached by 1968, including the ICEL translation of the Canon which remained in place, with only minor changes, right up until now. I can clearly recall that they introduced the acclamation after the consecration during 1969, which isn’t shown in this version. In those days it was just restricted to “My Lord and my God”. I’m pretty sure the last Gospel had also gone by that stage as well. I also can’t honestly recall whether they used the Douay Reims translations for the Epistle and Gospel, or whether a more modern translation was used but the versions of the Gloria, Creed and Sanctus with the “thees” and “thous” remained in place until 1975, when they went over to the (now happily obsolete!) ICEL versions. Monsignor Patrick Francis Cremin, Professor of Moral Theology and Canon Law at St. Patrick’s College, Maynooth, gave a four-part interview to the Irish Independent in November, 1978, denouncing the doctrinal turmoil in the Irish Church and the pastoral negligence of the Irish hierarchy. A theological conservative, Mgr Cremin grew increasingly disillusioned with the liberal drift of the Irish Church in the aftermath of the Second Vatican Council. The first, second and fourth parts can be read in full here. Posted below is the third-part of the interview, which concerns Maynooth seminary, where he was chair of both Moral Theology and Canon Law from 1949 until 1980. Mgr Cremin had been appointed by Pope John XXIII as an expert to prepare for the Second Vatican Council and served on three of the Council’s commissions. He served as a peritus to Archbishop John Charles McQuaid and as an expert to the Irish bishops throughout the Council (as he did at the 1956 Maynooth Plenary Council) and was charged by the papal nuncio with giving the press conference on Pope Paul VI’s Humanae Vitae to an unreceptive Irish media, following its release in 1968. He would later become involved in drafting the new Code of Canon Law. There is, first, the fact that the Irish Bishops as a body, and especially some of them individually, have not taken the necessary steps to protect our Catholic Faith and Teaching, by ensuring that, in Ireland, professional theologians and pseudo-theologians (and priests influenced by them) were not permitted to propagate with impunity doctrinal and moral teaching that was misleading or unsound. (i) But they have been permitted, and at a time when our faithful people have become particularly vulnerable to the effects of wrong or confused teaching, since the valuable, indeed the indispensable, programme of catechetical instruction, that had to be covered, in a two or three-year cycle, by priests in their sermons at Sunday Masses, has largely been abandoned. Moreover, this has happened at a time when such systematic instruction has become particularly necessary for the reassurance of the faithful, who are disposed to think right but are bewildered because of the absence of confirmation of their religious views. 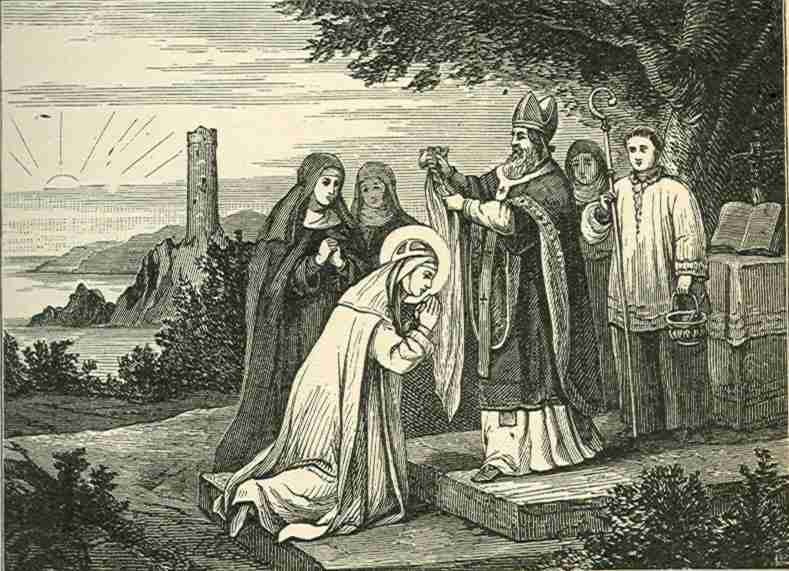 The result is that nowadays our people receive little solid instruction and rarely hear of the commandments of God, or of sin and repentance, or purgatory and hell, or of some of the great Christian truths and devotional practices, such as the sacrifice of the Mass or the value of devotion to Our Lady, especially in the Rosary. In addition the faithful, and particularly parents of school-going children, have the further anxiety of having to try to cope with the “new catechetics”, and its delayed presentation or dilution (or worse) of the truths to be believed or of the moral principles to be followed by those who are members of the Catholic Church. (ii) There is, secondly, the fact that the Irish Bishops have not taken the necessary measures, over the past several years, to save our national seminary at Maynooth from progressive deterioration and, as I believe, in certain respects near disintegration in vital areas of the life of the seminary and of the formation of the young men being trained in it for the priesthood. One factor that has largely contributed to this has been the ill-conceived decision taken by the Bishops in 1966 to open our national seminary, in the way it was actually opened, to non-clerical students, including male and female lay students and nuns, without any proper planning or direction then or since, as far as protecting some seminary way of life and the proper formation of its resident clerical students was concerned. I am not directly concerned here with the National University side of Maynooth College. As regards the seminary proper, things were just allowed to happen and happen, to the detriment of the seminary itself and therefore of the Irish Church, of which this national seminary had been the nerve-centre for more than a century and a half. And the glory that once was Maynooth, especially in the English-speaking ecclesiastical world and in missionary lands, has vanished, perhaps never to return. There has been no evidence of order in this seminary for many years, and I am not speaking here of order based on an application of the old strict Maynooth discipline. Moreover, there has been much evidence of disorder, and of lack of due respect for the standards of community living. In fact, when the infection discernible early on in our seminary was not dealt with, it inevitably spread to the point where disorder has gradually come to be taken for granted, and accepted by many as the “order” of the day. Not only that, but there has been what rather incredibly appears to be a permitted policy of drift and of anarchy or absence of rule. And I am not speaking of authoritarian rule, but of the exercise of that rule which, as the Second Vatican Council emphasised, consists in service that consults the best interests of the individual and of the community. These unwelcome facts — referred to only very briefly here — concerning our national seminary cannot be discounted by the whitewashing or window-dressing that has gone on, for a number of years now, on the part of some of those who, at the different level of administration and government, have had responsibility for the situation which the facts represent. From time to time, in publicity exercises in the press or elsewhere, the public have been given to understand by some of them that “All, or nearly all is fair in the garden,” when in actual fact there is no longer any garden but something of a wilderness. In a situation of this kind, no ordinary business concern could survive, not to speak of an institution comparable to Maynooth College, which is not just any institution but Ireland’s national seminary for the training of young men for the priesthood. But of course the question must be asked: Has our national seminary really survived, if survival is understood to involve the preservation of essential values and standards without which it is no longer what it was? A tragic aspect of this situation is that those seminarians, who are seriously aspiring to the priesthood, are not receiving the full essential formation for which they came to Maynooth College, even though they are not only willing but anxious to receive it. Naturally they themselves or at least many of them do not even know what they are being deprived of, since they are not aware of what their formation should be. The students themselves, therefore, are the losers and the victims of the situation in the seminary, even without their knowing it. After all, they did expect some challenge when they came to Maynooth College to be trained for the priesthood. But for that training the only real challenge ultimately is the practice of self-denial and the cultivation of the spiritual life. As a means to that end, some silence, some spirit of contemplation, some curtailment of liberty must be insisted upon, and must be accepted by those who are aspiring to become the official representatives of Christ, who appeals even to any ordinary follower of His to deny himself, take up his cross daily, and follow Him. It is not really too surprising then, if, not finding the challenge they expected in some form of curtailment of liberty and self-denial, some clerical students who did appear to have a genuine vocation to the priesthood, have left the seminary in their early years through disillusionment. Neither is it very surprising if, by reason of the confusion to which they have been exposed in some of their theological formation, other clerical students have left the seminary only at a very late stage in their course — perhaps, unfortunately, too few such students. How many, notwithstanding some theological confusion, have been accepted by their Bishops for priesthood without their complete theological formation being assured, only to add to the confusion of bewildered members of their flock? Even if our national seminary were to be recreated tomorrow in some appropriate, sensible form, and enabled to rise phoenix-like from its ashes; the question would still have to be asked — how badly served some Irish priests have been who were resident seminarians at Maynooth College during the past ten years. Only the passing of time in their ministry can answer that question for them or for those to whom they will have ministered. At this stage, the reader must be asking a question he may well have asked for the first time many years ago: What ever went wrong with Maynooth College? Since this question can be answered definitely only by the Bishops responsible for governing the College, and perhaps only by those of them with first-hand knowledge of its government since it was opened to non-clerical students in 1966, one can only speculate on the answer to it. Is it, perhaps, that the Bishops who did perceive the early ailments and the progressive sickness of our seminary, and who had the will and the courage to try to remedy them, were just not able to prevail against those, maybe only one or two, who gave a bad lead and were supported by others? Certainly, in the recent abnormal and critical years, as never before in the life of Maynooth College, a lead was needed which would be courageous as well as enlightened and wise; or was this too much to hope for in the disordered state of the Catholic Church? The lack of such a lead has cost our national seminary dearly, and therefore also the Irish Church. For how long more, under Providence, must Maynooth College, and those who are attached to it or concerned about it, suffer in this way? Read this for an insight into a very different Maynooth (and a very different Ireland). Mgr Cremin is actually mentioned on page 91. The Encyclical, nevertheless, concerning as it does the source of human life, was bound to arouse strong feelings. Whatever decision the Holy Father made was bound to be a test of faith. Some Catholics were convinced that a change in the moral teaching and practice of the Church was inevitable. Others were just as strongly convinced that any change would be a betrayal of the faith. The following sermon (posted below) was given by the Most Rev. John Charles McQuaid, Archbishop of Dublin and Primate of Ireland, at thanksgiving devotions in the Dublin Pro-Cathedral on the 9th December, 1965. Following the devotions — which had been organized in response to the specific requests of Pope Paul VI — the Archbishop imparted Benediction, at which the Te Deum was sung. The sentence quoted in the title is often represented by Establishment commenters (whether media, academic, or ecclesiastical) as epitomical of Archbishop McQuaid’s reactionary attitude towards change in the Church. During the first session of the Second Vatican Council, Archbishop McQuaid distinguished himself as the only member of the Irish hierarchy to make a contribution — and did so from a predictably conservative standpoint. As a lover of Latin language and culture, he viewed proposals for an all-vernacular liturgy as tantamount to vandalism. He also expressed his opposition towards suggestions that competence over the local liturgy be transferred from individual bishops to national episcopal conferences. Xavier Rynne (the chronicler of the Council) records that “Archbishop McQuaid of Dublin came out once more against any thought of change”. Sensing the progressive trajectory of the Council (as well as the lack of receptivity towards his conservative positions) he remained aloof from the next three sessions. Archbishop McQuaid took a low view of ‘aggiornamento’ and found it very hard to adapt to the rapidly changing Church of the 1960s. Indeed, he has been demonized ever since as an obscurantist authoritarian. His implementation of the liturgical reforms was very conservative, and frustrated more radical, younger clergy (some of whom would later defend his legacy against lazy liberal caricatures). For five long years the bishops of the world have been sustained by your constant prayers. In the very laborious session of the Council we have felt the power of your prayers, and if the Council was concluded in a spirit of peace and unanimity we owe that grace to God the Holy Ghost and to the intercessions of Our Blessed Lady. On Wednesday, 2,300 fathers parted. It was a sad moment, for we shall never again see one another in this life. Drawn from every corner of the world, the Bishops had prayed and worked together for a long time. Now is our work completed: in union with the Pope, our decrees were drafted, voted on and preached. One could not but feel that God the Holy Ghost had guided our deliberations and gently brought them to a firm conclusion. You may, in the last four years, have been disturbed by reports about the Council. May I, who have assisted at every meeting of the Council, assure you that the Council was a wondrous example of dignity, seriousness and courtesy. You may have been worried by talk of changes to come. Allow me to reassure you. No change will worry the tranquility of your Christian lives. For, time after time, Pope John XXIII and our present Holy Father have insisted — but the point has been sadly missed — that our deliberations in the Council had only one purpose: to search the deposit of the Faith, to look more deeply into the teaching of the Church. The Council has one meaning only for us — in all its constitutions and decrees: how can each one of us in his personal and family and social life be faithful to the teaching of Jesus Christ, Our Lord, as the Church makes known that teaching in the Vatican Council. As the months will pass, the Holy Father will instruct us gradually how to put into effect the enactments of the Council. With complete loyalty, as children of the one, true Church, we fully accept each and every decree of the Vatican Council. Debates at the Vatican Council are no longer secret, but discussions in the Conciliar Commissions remain confidential. It is not yet possible, therefore, to disclose full details of the agenda for the session due to commence in September. But speeches of the Pope and some of the cardinals in Rome make it fairly clear that certain subjects are bound to be debated. It seems likely, for example, that the Council will issue a statement on religious liberty and on the Jews. Decrees on Christian unity will be promulgated. These are eagerly awaited in this country, since they will enable the Hierarchy to draw up rules for the guidance of clergy and laity in ecumenical work. Today and for a long to come much of the life of the Church will be dominated by the teaching and decisions of the great Vatican Council which has just been concluded. It is often said that the Council was the Church adapting herself to the conditions of a changing world. I believe that the changes which have taken place in the world in recent years, dramatic though they be, are but a foretaste of a profound transformation of human society and human thought which has only just begun and which may take anything up to a hundred years to work itself out. Note: This pamphlet was published in 1967 and is posted here for historical reasons only. Readers disposed to high blood pressure are advised to refrain from reading it. The following is an extract from an article on ‘Active Participation in the Mass’ by Rev. John Fennelly, P.P., published in Doctrine and Life, November, 1955. Discussion on the introduction of the vernacular into the Mass rite itself would be outside the scope of this article. An increasing volume of liturgical opinion favours a limited use of it in the forepart of the Mass. The Mass of Catechumens would therefore resume its former role and primary function of instructing the people. At the International Liturgical Congress in Lugano (1953), a strong recommendation was forwarded to Rome by the delegates assembled, that the Collects, Epistle and Gospel should be heard directly from the sacred minister or ministers in the language of the people. Permission to use the vernacular in the administration of some of the Sacraments has been granted to many countries. The use of the vernacular by the people is a totally different matter. A notable change has taken place within the past thirty years in Church policy with regard to hymns and prayers for popular use at quasi-liturgical functions like a Holy Hour. The general tendency nowadays is to encourage the people to pray and sing in their own tongue. The Germans are permitted to sing the common of the High Mass in German. It does not seem reasonable to force Latin on the ordinary congregation, if the people can be permitted to ‘pray the Mass’ in a language they understand. […] Common prayer, seasoned with a little singing, is a reasonable contribution to ask from the faithful towards the splendour, dignity and social character of the Sacred Mysteries. 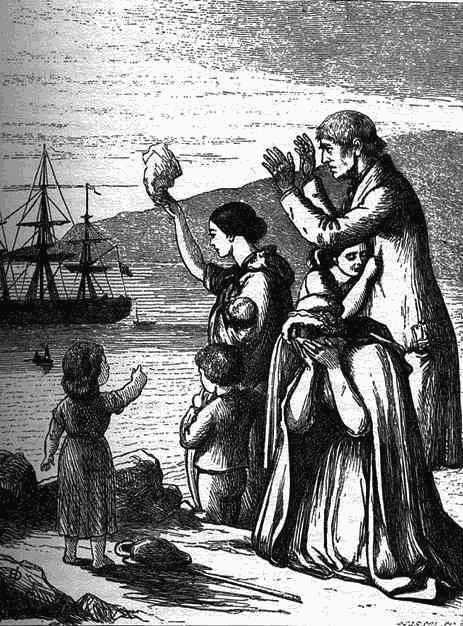 It is the most and the least to expect from the average congregation assembled for Mass in the Parish Church here in Ireland or, perhaps, anywhere. […] And though Penal days are long gone by, the people have not regained their voice or attempted to take their rightful place in the Sacred Liturgy […] Few are prepared to maintain that the Plain Chant revival movement, into which the schools have thrown themselves wholeheartedly, has yielded the results expected of it. […] The social and liturgical movements now stirring the Church are closely connected and inter-dependent. One cannot succeed without the other. Both set out to correct excessive Individualism and lead to the formation of the Christian community. Both derive their inspiration from the doctrine of the Mystical Body. Neither movement can be hurried. A whole generation may pass away before the social and liturgical teaching of the Popes becomes an active force influencing the public mind and penetrating into the sanctuary of the Church. […] It has been noticed that both these reform movements within the Church make striking progress in areas where the Church is subjected to severe pressure. At the International Liturgical Congress of Lugano, 1953, Bishop Weskham, of Berlin, could testify to the rapid progress of every kind of liturgical endeavour in the part of his diocese under Soviet control. […] There is no denying that the Roman Mass rite, as it stands, is ill-adjusted for teaching the populace or training their minds towards active, intelligent, and social participation. Fr. Clifford Howell, S.J., goes into this matter fully in his popular book on the Liturgy The Work of Our Redemption. Not only is there a lack of adjustment between the individualistic-minded laity and the communal-minded Liturgy, there is also an element of aloofness and elusiveness in the liturgy itself. In addition to the barrier of language, there exists a number of features that militate against intimacy. That is particularly noticeable at a low Mass. The priest has his back to the people and even when proclaiming the good tidings of the Gospel, does not face them. The present Mass rite and the rubrics governing its celebration were framed in the sixteenth century, at a time when participation on the part of the people was at its lowest ebb. Little change has been made since the time of St. Pius V. […] Admission of the vernacular into the Mass rite would, at the time, have been equivalent to sanctioning doctrinal error and opening the door to devotional and liturgical chaos […] The matter can now be debated on its merits. […] Many are unconscious of strong currents of social and liturgical reform moving within the Church, and, therefore, fail to understand a desire for change even when it is proved that the ‘innovation’ is a return to earlier and sounder tradition. They have no sympathy with the Pastor who would like to celebrate Mass facing his people at a small liturgical altar situated well down the Church, or who wishes for a revival of the Offertory Procession, the singing of the people during the distribution of Holy Communion, of the employment of Lectors to read the Collects, Epistle and Gospel of the day in the language of the people. These reforms are pressed for in regions where the Church can no longer control the school, and where religious education of any kind is banned in state schools. […] The new Easter Vigil rite incorporates many features that have long been desired by advocates of liturgical reform. It seems to be a portent of what may be expected in time to come. The Holy See will proceed slowly and with due regard for varying national conditions. But it cannot be doubted the liturgy has begun to move out of a feudal or ‘fossilised’ state. […] Should Pastors wait until reform measures are completed, or ought they take steps to prepare the minds of the people — especially youth — for impending change using the best means at present available? Mediator Dei leaves no room for doubt as to which course should be followed: ‘Strive earnestly, by methods and means which your prudence judges most effective, to bring about a close union between clergy and laity: that the faithful may take so active a part in the liturgy that it becomes really a sacred action in which both priest — especially the priest in his own parish — and people join in offering to Almighty God the worship which is His due’. Work on the people and with the people may begin under the direction of the Pastor with the approval and sanction of ecclesiastical authority. The following statement was issued by the Bishops of the United States in December, 1963, in response to the promulgation of the Second Vatican Council’s Constitution on the Sacred Liturgy. 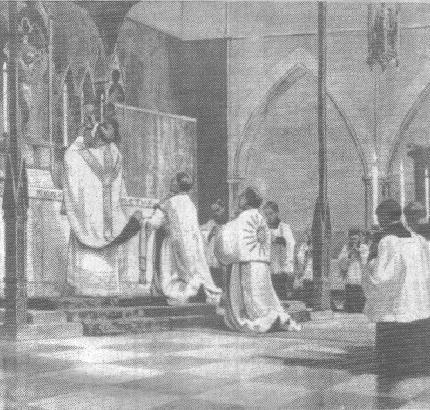 The Constitution on the Sacred Liturgy promulgated on 4 December is the first achievement of Vatican Council II. It will affect the spiritual life of prayer and worship of all Catholics. It will make the Church more comprehensible to all men. This is the first great step in the Church’s inner renewal begun by Pope John XXIII and now being carried out by all the bishops in union with the chief bishop, Pope Paul VI. The bishops of the United States, having taken part fully in the discussion, amendment and acceptance of this document, welcome it wholeheartedly and dedicate themselves to fulfil its purposes.